Beth Sholom is proud of its wonderful building and sanctuary, including our several memorial boards. Community members are encouraged to remember loved ones by donating a plaque in their memory. For a one time donation of $398, the customized plaque is made and installed, usually within a 6 - 8 week timeframe. Each plaque has small lights which are lit for the full month of the Yahrzeit each year, as well as each time that Yizkor is recited through the year. Beth Sholom is honored to have dedicated LAMPLIGHTERS. 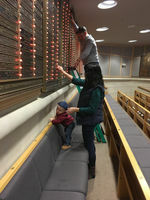 Each month, this group of volunteers has the privilege of demonstrating Kavod - proper respect for those who are no longer with us - by continuing the Beth Sholom tradition of lighting the individual bulbs on the Memorial Boards in commemoration of Yahrzeits and all the individual bulbs when Yizkor is recited. Participate in this meaningful project. New Lamplighters are always welcome. Contact Toby Berman regarding the 2019 dates you are available to serve. Beth Sholom members should log in so that request is associated with account. Please choose the number of plaques you would like to order. Fields to complete will appear for each plaque being ordered. What is the remembered person's English name? If only reserving a space on the board put "RESERVED". What is the remembered person's Hebrew name? (if unable to to enter Hebrew characters, please enter the best English spelling of the Hebrew name)? If not known, please contact the shul office and the office staff will assist you. * Should the plaque be in the Men's or Women's Section? AGP can bill to account on payment page.